I really like when art galleries do something innovative. Its all too easy to disregard art as boring and old (and thats coming from a card carrying culture vulture), so anything that renovates this image is a good thing. Tate Modern has done something really clever, they are running Twitter tours of their main exhibitions. The most recent was for Lichtenstein: A Retrospective. Co-curator Iria Candela walked through the exhibition from start to finish, and tweeted her thoughts from every room. You could follow her tweets on @tate, and then see the discussion using #tatetour. A very simple concept, but one that ticks all the innovative boxes. 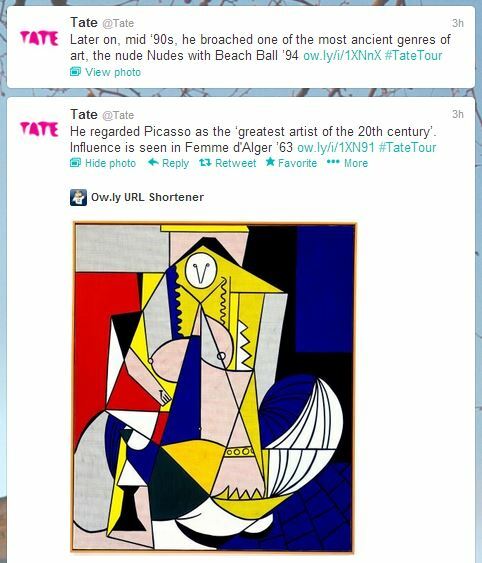 First up it brings art to the people, I found out about the #tatetour by looking at my twitter feed. Simple. No effort. But more than that it takes the overwhelming world of art/art history and breaks it down into tweet sized chunks. It entices the reader to take the next step and go and visit the exhibition itself. All this for very little cost to Tate – just have to teach a curator to use twitter and have at it.